Chateau / Country House4305 sq. ft.
Family home, 6 Ensuite Bedrooms, in village with private pool & pool house. Summary - Beautifully restored manor house set in 2 acres of enclosed gardens. Sleeps 12 guests in six en-suite bedrooms. Private heated pool 12m x 6m, level depth of 1.4m. Large pool house with summer kitchen and WC. Wi-Fi internet and UK TV. Served by 3 airports within a 90 minute drive. Built in the 19th Century and previously owned by the same family for over 150 years, Le Manoir is a restored manor house set in the heart of the Perigord Vert. An area of outstanding beauty, with rolling green hills and forested deep valleys, the region is famed for picturesque villages and ancient market towns. Whether guests are seeking an active vacation or a period of relaxation reclining by the heated pool, Le Manoir provides a tranquil base from which to experience authentic France. There are a wealth of local attractions, from exploring the local history and UNESCO-listed caves to visiting spectacular castles and verdant gardens, there is something nearby to cater to every taste. Le Manoir is set within an enclosed 2 acre garden, offering families a safe space to relax and play. The large south-facing terrace makes an ideal dining venue in warmer months, with views across the garden onto the village and 12th century church. The garden itself is mainly laid to lawn, creating plenty of space for ball and racket games, while the ancient lime trees provide some cooling shade in the summer. The large private salt water pool and pool house face south and provide an ideal spot for guests to lie back and unwind. The pool house contains a summer kitchen with a fridge and good sized gas BBQ and has an open log fire, comfortable seating and covered dining table for up to 12 guests. The village of St Sulpice d'Excideuil has a population of just 335, the majority of the villagers have lived locally for many years, enjoying the rural location, but with city access just a short drive away. The fortified 12th century church is at the heart of the village, with a small bar and bustling village shop opposite, stocking local produce, fresh bread and food essentials, and baking pizzas to order at the weekend. The Perigord Vert is the ideal region to explore, be it on foot, bicycle, canoe, horse or even velo-rail. There are numerous historic and picturesque towns and villages with their restaurants, shops and vibrant markets. Spectacular castles and gardens are within easy reach as are pre-historic caves, family friendly zoos and farms. The lake near St Yrieix not only has a beach and extensive children's play area, it also hosts an impressive water-skiing site. Elsewhere for those with a head for heights, rock climbing or ballooning are also available. Living Space - Formal and informal sitting rooms, both with direct access to terrace. Wood burner in the informal reception room. Original spiral staircase to upper floors. Highchairs and changing mats available. Dining/Kitchen - Fully equipped kitchen with adjacent dining room seating 12, opening onto raised terrace. Bedrooms - Four large bedrooms with king sized beds. Two large twin bedrooms (alternative double bed available upon request). 400 thread count cotton bedding and silk filled duvets. Three full en-suite bathrooms with shower and separate baths, three en-suite shower rooms. Secluded spots - Large roof terrace with seating. Reading area on each floor, with desk and books. Pool and Pool House - Heated salt water pool with wide steps for easy access. Large stone terrace with sun-loungers. Open fireplace with comfortable seating area and covered dining table for 12. Summer kitchen with sink, fridge and good sized gas BBQ. The area is renowned for its passion for food and top quality produce. The local town, Thiviers (5 miles), is self-proclaimed as the 'Capital of foie gras' whilst the nearby village of Sorges (15 Miles) claims to produce the best truffles in the world. Within a short distance are also an abundance of thriving market towns, including Thiviers, Excideuil, Brantome, Sarlat and Perigueux all of which showcase the best of local produce in their twice weekly markets. During the summer months there are also numerous Night Markets where visitors may enjoy sociable alfresco dining on long trestle tables alongside local residents. The World famous caves of Lascaux are within an hour’s drive of Le Manoir. A UNESCO world heritage site, the caves were discovered in 1940 and renowned for their Paleolithic paintings. Closer to home, the caves at Villars and Tourtoirac are also spectacular and highly recommended. The Dordogne region is reputed to have 1001 chateaux and castles, many of which are open to the public and can be visited during the summer months. Hautefort, Jumilhac-la-Grand and Losse are all fine examples and are within easy reach. There are also a number of impressive gardens that can be visited, among them Jardin de Marqueyssac with its 150,000 topiary boxwoods and les Jardins du Manoir d’Eyrignac, with its seven gardens, ranging from the white-themed garden to topiary sculptures. Brantome, ‘The Venice of Perigord’, is an idyllic village with a Benedictine abbey founded in the 8th Century, which along with Perigueux and Sarlat-la-Caneda, offers visitors ancient beautiful buildings and vibrant streets. While St Jean de Cole is nearest of the five acclaimed ‘Les Plus Beaux Villages de France’ in the area and makes an ideal stopping off place for a leisurely coffee or beer. The Perigord Vert is the ideal region to explore, be it on foot, bicycle, canoe, horse or even velo-rail. The lake near St Yrieix not only has a beach and extensive children's play area, it also hosts an impressive water-skiing site. Elsewhere for those with a head for heights rock climbing or ballooning are also available. Arnac-Pompadour has a vast castle overlooking a spectacular racecourse and the police horse centre at Brantome comes very highly rated. The Parc zoo at Reynou caters well for families as do the various farm visits available in the area.10 minute drive to local market towns of Thiviers and Excideuil. Retired Commander Royal Navy now living in France with brother Nicholas (Chartered Surveyor) and breathing life back into a small French Chateaux. Love wine, the French way of life, the countryside and dogs. Every effort has been made to preserve the character of the property as a family home providing ample space to relax and totally unwind. We were very particular in what we wanted to provide: a spacious traditional French family home designed to relax in plus all the features that we would want to find when on holiday. It was also important that the property was within a genuine French community and within easy reach of the myriad of touristic sites for which the region is famed. We also wanted to be on hand for our guests but far enough away so not to intrude. After a challenging search we found Le Manoir. Le Manoir is a beautiful 19th century family home situated within a small village in the heart of the Perigord Vert. Over the last two years we have undertaken an extensive yet sympathetic restoration using traditional methods, materials and local craftsmen. Being on site throughout has enabled us to oversee every detail and ensure the original features and atmosphere of the house have been retained. The house now provides six generous en-suite bedrooms, numerous reception rooms, a roof terrace and also a few tranquil corners for getting away from it all. The rooms are generally furnished with period French furniture and fittings that are both elegant and robust enough to handle family life. The carpets and curtains have been chosen to match the age and character of the house. The kitchen is fully equipped and there is a separate laundry room. To maintain its atmosphere, we limit the number of guests to twelve plus the odd baby or two. Externally there is a large heated pool. The old farm buildings have been converted to provide a spectacular stone pool house complete with large sitting/dining area, summer kitchen and even an open fire. The grounds are mainly laid to grass with large lime trees providing shade and adventure. Both the house and pool face south and take full advantage of the sun throughout the year. The large ground floor windows fill the house with light and the thick stone walls help maintain it as a cool refuge during the hottest days of summer. Built in the 19th Century and previously owned by the same family for over 150 years, Le Manoir is a restored manor house set in the heart of the Perigord Vert. An area of outstanding beauty, with rolling green hills and forested deep valleys, the region is famed for picturesque villages and ancient market towns. Whether guests are seeking an active vacation or a period of relaxation reclining by the heated pool, Le Manoir provides a tranquil base from which to experience authentic France. With a wealth of local attractions, from exploring the local history and UNESCO-listed caves to visiting spectacular castles and verdant gardens, there is something nearby to cater to every taste. Le Manoir is set within an enclosed 2 acre garden, offering families a safe space to relax and play. The large south-facing terrace makes an ideal dining venue in warmer months, with views across the garden onto the village and 12th century church. The garden itself is mainly laid to lawn, creating plenty of space for ball and racket games, while the ancient lime trees provide some cooling shade in the summer. The large private salt water pool and pool house face south and provide an ideal spot for guests to lie back and unwind. The pool house contains a summer kitchen with a fridge and good sized gas BBQ and has an open log fire, comfortable seating and covered dining table for up to 12 guests. The Perigord Vert is the ideal region to explore, be it on foot, bicycle, canoe, horse or even velo-rail. There are numerous historic and picturesque towns and villages with their restaurants, shops and vibrant markets. Spectacular castles and gardens are within easy reach as are pre-historic caves, family friendly zoos and farms. The lake near St Yrieix not only has a beach and extensive children's play area, it also hosts an impressive water-skiing site. Elsewhere for those with a head for heights, rock climbing or ballooning are also available. Thank you so much, we loved hosting our first Canadian guests. Competitive croquet by candle light was also a first and hopefully the start of an annual tournament! Fantastic Property with many charming details. Excellent Hosts! The Manor house and pool are fantastic. The Hosts are great and every little detail is very well thought out. We had a great week. There is one EXCELLENT Bedroom, One slightly less, and each of these has an adjoining bedroom perfect for kids, etc. Upstairs two more Bedrooms which are fun and unique. Not as easy to climb to, however. The pool house is fantastic we spent most of our time there. The town is tiny but has a nice gourmet shop/ market and a small bar which is not open very much... St Sulpice d'Ex is very nicely located and easy to get everywhere, we rented electric bikes and covered a lot of ground from there. We will return to the Manor! Thank you so much for this review, we really enjoyed hosting you. We have now purchased an ice machine so there will be plenty for you on your return! What a wonderful time we all had on our week's stay at Le Manoir St Sulpice - D'Excideuil. We are a family of eleven, age ranging from Granny at 71, down to Margot, the youngest, at 3. From the moment the first of us arrived and were shown the house by both Nicholas and Simon, we felt totally welcome and very much at home. Le Manoir is stunning, so much space to feel comfortable in, and every room is so beautifully and thoughtfully decorated and furnished. Every modern convenience is ready for use: the kitchen has generous numbers of devices and helpful machines, and enough cutlery, glasses and crockery to cover all requirements. We all found the beds faultlessly comfortable, and each bedroom having its own modern and well appointed bathroom made such a difference. The hot water was constant- always important where several children and fastidious adults are concerned. But enough of the huge advantages of the house: outside- an eye watering variety of games awaited : badminton, a football goal, cricket bats and ball, croquet for the less agile and the most attractively set swimming pool, with enough good quality lounges around it for us all. An open fronted loggia beside the pool was a delight. In it a huge fireplace ( logs supplied and replenished every day) gave warmth as we sat at the enormous beautiful oak dining table for relaxed evening cocktails and meals. A barbecue and a plancha gave the men the opportunity to show off their culinary prowess and all the tableware we needed was available there in wall cupboards, above worktops and a sink. A modern loo in one corner meant leaving to go to the house was unnecessary throughout the evening. Finally, the garden : the rose beds were glorious, the topiary clever, the lavender prolific and the vegetable and fruit gardens Chelsea ready. An unexpected extra gardening guest wandered by on our sight each evening: to the delight of us all - a hedgehog! We cannot thank Simon and Nicholas too much for providing such a perfect place to stay and enjoy, away from our fast moving everyday lives.Their tolerance and generosity knows no bounds, such kind hosts, such interesting people - we can't wait to visit again. Thank you so much for the really positive and kind review. We really enjoyed meeting and getting to know you all. We were so pleased that you made full use of everything we have to offer here. We would love to welcome you here again. 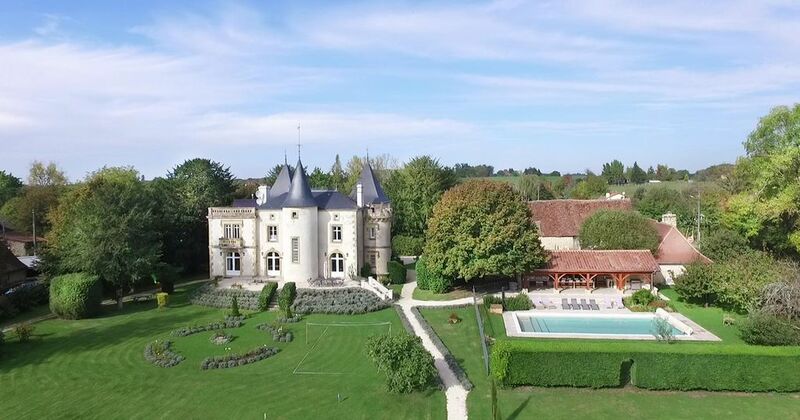 The chateau boasted every facility one could wish for in a holiday: comfortable bedrooms with ample bath/shower rooms; modern well equipped kitchen, several areas to choose from for meals, so our party of 8 adults and 5 children was comfortably accommodated. Our hosts, Simon and Nicholas Corry were attentive without being intrusive. They had thought of everything to please their guests, from the attractive poolside area with covered dining and BBQ facilities to table tennis, badminton and trampoline. There was even a well stocked toy and games cupboard for the young and not-so-young. We all appreciated the reading and writing areas and the books and stationery provided Two roof terraces supplied both views and peace if there was a need to retreat from the main party for a while! The only downside was the lack of a shop in the village as the owners were on holiday the week we were there. The village of Excideuil had a good supermarket which was a short drive away and on most days someone was out and about to collect fresh bread for lunch at least. It was no hardship to settle for pain au chocolate and croissants heated for breakfast.We spent most of our time enjoying the chateau though other attractions like caves, historic villages, markets and the lake with a beach, were a half hours' drive away on average.As with most old buildings that have been converted there were a few quirks, like the spiral staircase and a couple of low doorways, but one soon learned to duck! The conversion was completed to the highest standards and our family is most grateful to Simon and Nicholas for their hospitality. Thank you so much for your feedback. We are delighted you enjoyed your stay and hope to welcome you back soon. Fantastisch kasteel met gastvrije service. Het huis zag er van binnen nog mooier uit dan wij verwachtten. Zeer smaakvol en ook praktisch. Alles aanwezig ook voor een verblijf met kinderen. Buitenruimte ideaal bij mooi weer met prachtig en veilig zwembad. De prachtig onderhouden tuin biedt veel ruimte voor sport en spel. Een rustige omgeving in een prachtig landschap. 10% VAT is included in the pricing. Arrival 4 PM Departure 10 AM 12 guests max (plus 2 babies). Sorry no pets allowed. Saturday (out of high season negotiable but minimum of 3 nights stay). It is recommended that all guests take out insurance to cover potential cancellation and any accidental damage caused during your stay at the property. Cleaning of bathrooms and communal spaces will be provided 3/4 times per week. Please leave property in a tidy state. No smoking in the house. All linen and towels including pool towels are included in the price and are changed weekly. Energy costs - Included in the price. The hirer may be asked to pay for damage caused to the house or its contents, but not for minor accidental breakages. The hirer is expected to take every reasonable care of the house and its contents, ensuring that the house is secure when left vacant. The hirer is responsible for the security and safety of the hirer’s own property. The heated pool is available from May-Oct. The pool is fitted with a safety cover which should remain closed unless a responsible adult is supervising the pool area. When in use, the pool area will be cleaned daily between 0700-0830 and is not available to guests without prior consultation with the owners. Running in the vicinity of and diving into the pool are not permitted. Wi-Fi available - Guests should note that due to the rural location Wi-Fi is occasionally interrupted particularly during thunderstorms.